Certified Organic means the plants used are grown without toxic pesticides, herbicides, or chemical fertilizers. It’s regulated by the USDA. Pure means plants were used. The plants can be grown in any condition with chemicals and pesticides and still be considered pure. The “Pure” products are NOT officially regulated. Pure does not mean Organic. By law Organic products must be certified by the USDA. Only 100% Certified Organic products can bear the USDA Organic Seal on the Label. To be CERTIFIED all ingredients must meet or GO ABOVE & BEYOND the USDA’s STRICT STANDARDS. 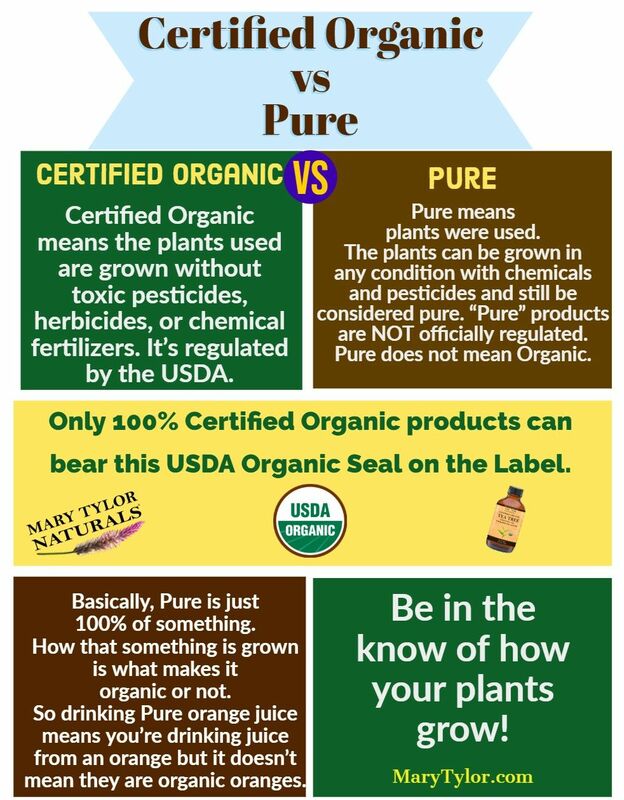 Basically, Pure is just 100% of something… how that something is grown is what makes it organic or not… and how that organic plant passes the US Dept. of Agriculture’s standards and testing verifies if it is 100% Certified Organic. So drinking Pure orange juice means you’re drinking juice from an orange but it doesn’t mean they are organic oranges. “Pure” doesn’t explain what those oranges were grown in or how they were grown. Be in the know of how your plants grow. No Chemicals, No Toxic Pesticides, No Herbicides and No-GMOs. Mary Tylor Naturals is 100% Certified Organic.